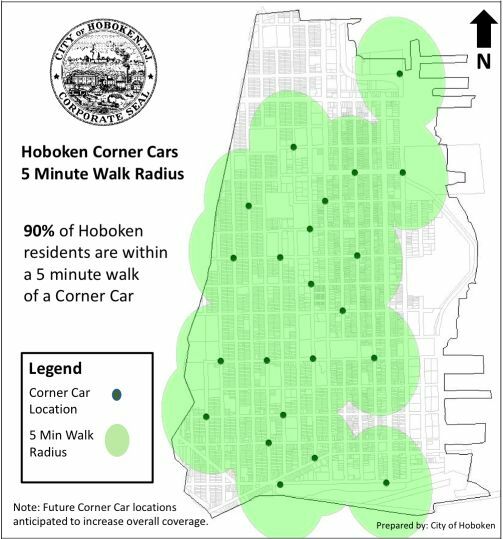 The program, called Hoboken Corner Cars, seeks to sprinkle car-sharing vehicles on-street throughout the entire city – complete with exclusive, reserved parking spaces – so that these vehicles are much more accessible and convenient than any personally owned car. Existing car-sharing statistics in Hoboken justify this special treatment; for every one of these vehicles placed in the community, over 17 households will choose to give up their cars, taking cars off the street and culling the glut of “recreational” ownership for residents who commute daily via transit. An additional 20 or more households say they postpone or stop considering buying a car because car-sharing vehicles are available. The cherry on the sundae is a potential savings per household of $3,000 to $5,000 over vehicle ownership. This entry was posted on Friday, June 18th, 2010 at 10:48 am	and is filed under Cities, Commuting, Congestion, Uncategorized. You can follow any responses to this entry through the RSS 2.0 feed. Both comments and pings are currently closed.